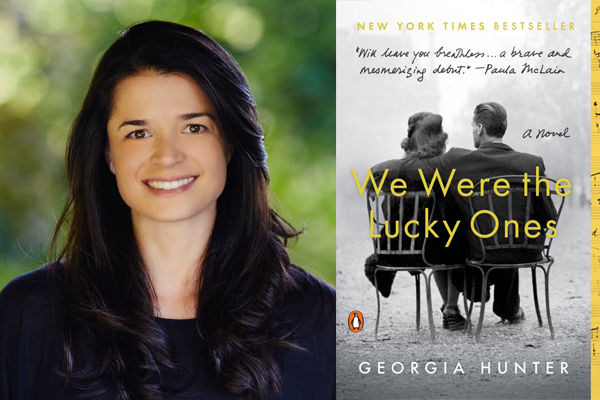 Join us for an intimate luncheon with author Georgia Hunter, when she will discuss her incredible novel, WE WERE THE LUCKY ONES. In 2000, a family reunion opened her eyes to the astounding war stories of her grandfather and his family. Eight years later, armed with a digital voice recorder and a moleskin notebook, she set off to unearth and record her family’s story. Georgia spent nearly a decade traversing the globe, interviewing family, and digging up records from every possible source she could think of, eventually piecing together the bones of what would become her novel WE WERE THE LUCKY ONES. It is the spring of 1939, and three generations of the Kurc family are doing their best to live normal lives, even as the shadow of war grows ever closer. The talk around the family seder table is of new babies and budding romance, not of the increasing hardships facing Jews in their hometown of Radom, Poland. But soon the horrors overtaking Europe will become inescapable and the Kurc family will be flung to the far corners of the earth, each desperately trying to chart his or her own path toward safety. As one sibling is forced into exile, another attempts to flee the continent, while others struggle to escape certain death by working endless hours on empty stomachs in the factories of the ghetto or by hiding as gentiles in plain sight. Driven by an extraordinary will to survive and by the fear that they may never see each other again, the Kurcs must rely on hope, ingenuity, and inner strength to persevere. In a novel of breathtaking sweep and scope that spans five continents and six years and transports readers from the jazz clubs of Paris to the beaches of Rio de Janeiro to Kraków’s most brutal prison and the farthest reaches of the Siberian gulag, We Were the Lucky Ones is a tribute to the capacity of the human spirit to endure in the face of the twentieth century’s darkest moment. When Georgia Hunter was fifteen years old, she learned that she came from a family of Holocaust survivors. We Were the Lucky Ones was born of her quest to uncover her family’s staggering history. Georgia’s blog, weweretheluckyones.com, offers a behind-the-scenes glimpse at the extensive research this project has entailed. She lives in Connecticut.